The famous Rocamadour Cheese Festival will soon be here again. This 24th edition of Fête des Fromages de Rocamadour will be held on Sunday, May 17, 2015. The Rocamadour Fête des Fromages is one of the few events dedicated exclusively to cheese from the South of France. Up to forty producers will be at the Fête with their farmhouse cheeses – 15 producers of goat milk cheeses, 15 sheep’s milk cheeses and 10 producers of cow milk cheeses. The day’s program begins at 10:30 a.m. with a “Fruits de la Terre” mass, followed by the blessing of the sheep and goats, an inter-regional competition of farmhouse cheeses and a rustic lunch. The Cheese Farmers Market will be on the whole day and visitors will be able to taste and buy cheeses from the south of France, as well as enjoy some wine tasting. Throughout the day, musicians from the region will entertain. And before the day is over, the winning cheese of the 24th Fête des Fromages will be announced. 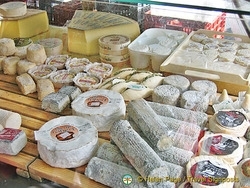 About 10,000 people visit the Rocamadour Fête des Fromages each year. So if you’re planning on staying in or around Rocamadour during the cheese festival, don’t show up without having pre-booked your accommodation. You can search for Rocamadour hotels, read hotel reviews and book your Rocamadour hotel here. Take a walk around Rocamadour old town with Travesignposts photos.